Since the vast majority of Dai people are concentrated in Xishuangbanna Prefecture and Dehong Prefecture of Yunnan province, they benefit from the richly fertile soil and temperate climate found in these regions. They have become accomplished farmers and are renowned throughout China for their high-quality rice, tea, bamboo, and sugar cane. In fact, during the Ming Dynasty (1368-1644), the pu’er tea grown by the Dai was considered so superb that it was worthy of being presented to the emperor! I’m sure you’ll agree that any tea good enough for an emperor is, at the very least, worth a try! Unfortunately, in recent years large portions of Dai farmland have been exclusively used to farm rubber and this has tragically proven rather destructive to the area’s natural ecosystem. Like many groups found in Southern China, the staple food of the Dai ethnic minority is rice, with people in Dehong preferring long-grain non-sticky rice while people in Xishuangbanna preferring glutinous sticky rice. Their cuisine is characterised by its love of spicy, sour flavours and features lots of pickled meats and vegetables, while also incorporating some bitter flavours. They have a preference for fish and chicken but will also eat duck, pork and beef, avoiding only mutton. Their signature dishes are slow roasted chicken, which is as tender as it is delicious, and pickled fish wrapped in lemongrass, which has a sharp but aromatic tang. 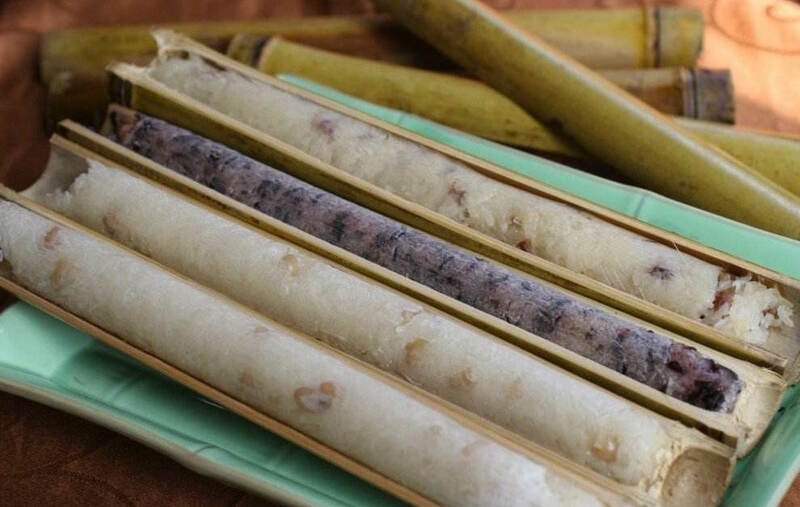 From November through to February, the Dai enjoy what is called the Bamboo Season. This is when species of fragrant bamboo, characterised by their thin stalks and long joints, become mature. The Dai call it “maihaola”, which means “rice-cooking bamboo”. They cut segments of it so that one end is open but the other still has a joint at the bottom. 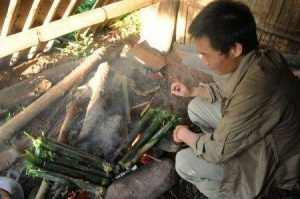 They then put rice into the bamboo tube, plug the opening with palm leaves and roast the tube over a charcoal fire until it emits a tantalising aroma. This bamboo cooked rice has a distinctive flavour imparted by the thin, fragrant film on the inside of the bamboo stalk. However, watching these jade green tubes as they are filled and gently roasted is a visual feast in of itself! The diet of the Dai people may seem simple enough, but they have one quirky eating habit that has become somewhat notorious and has evolved out of living in a humid sub-tropical climate. Whether they’re grilled with spices, deep-fried, or roasted, the Dai people love eating large insects. They are particularly fond of cicadas, bamboo worms and several species of spider. So while most creepy crawlies would have many foreign tourists running for cover, the sight of them is enough to give the average Dai person a rumbling stomach! When it comes to quenching their thirst, the Dai normally wash down these squirmy snacks with partially-fermented sweet wine or large-leaf un-perfumed tea. Paper-cutting is one of their traditional folk arts and is often used to design patterns on household articles such as bed linen, bags, and pieces of clothing. They employ beautiful and intricate motifs of trees, birds, insects, humans, and a myriad of other animals. Some even contain complex story-telling images that are relevant to Dai folklore. These patterns are similar to those found on “tong pa”, a type of satchel used by the Dai people for safekeeping a variety of items, from cigarettes and seeds to sewing kits and love tokens. These satchels are also intricately carved with images of animals, trees, and flowers, but the motifs and colours used bear some significance. For example, the use of green or red signifies respect for your ancestors, the image of the peacock symbolises good luck, and the image of an elephant denotes a good harvest and a happy life. This symbolism reflects the Dai’s reverence for nature and for their desire to strive for a better life. Deep within the Ganlan Basin, obscured by the verdant tropical jungles that loom over the banks of the Lancang River, the five small villages of the Dai Ethnic Garden have thrived for hundreds of years. They are just 28 kilometres from Jinghong, the capital city of Xishuangbanna Prefecture, and all of them are occupied by ethnically Dai people. 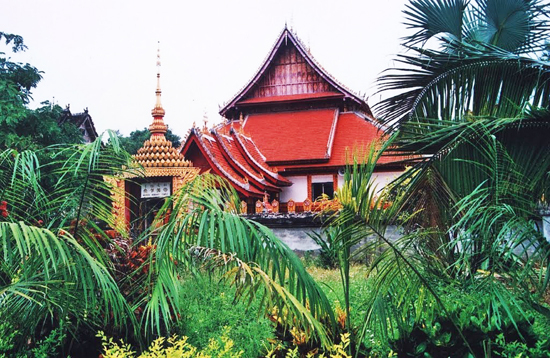 The basin benefits from the hottest climate in Xishuangbanna and is able to sustain numerous tropical plant species, which is what earned the place the name “ethnic garden”. 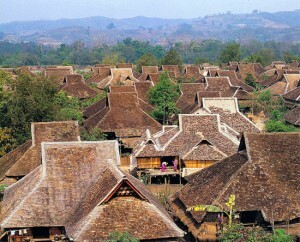 It is in fact more of a theme park, where visitors can learn about Dai culture and visit traditional Dai villages. The villages are called Manjiang, Manchunman, Manting, Manzha, and Manga, and together they house approximately 300 families and 1,500 villagers. They consist primarily of traditional Dai buildings, which are square, two-storey houses that are built on stilts and made entirely from bamboo. The ground floor is used as a storehouse and stable for livestock while the upper floor is used as a living space. The upper floor is normally 2 metres off the ground and can be reached via a wooden ladder, which can make ascending the house with a hot cup of tea quite a challenge! Yet this is how the Dai people will undoubtedly welcome you, as they are known for their incredible hospitality. 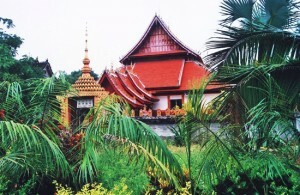 The Dai ethnic minority are traditionally Buddhist and so every village has its own Buddhist temple. It is important to note that you should take your shoes off before you enter any Dai home or temple, as a sign of respect. Dai handicrafts are on sale throughout the villages and performances of Dai folk songs and dances, as well as other folk customs, occur regularly on the main stage. 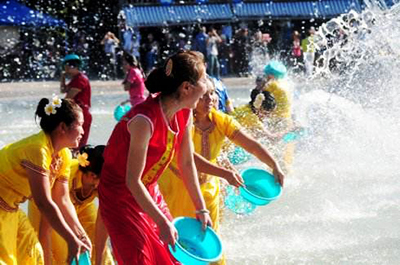 There is even a recreation of the Water Splashing Festival every day at 3pm, where visitors can join the Dai people near the fountain and throw water at each other. It’s one of the more delightful festivals celebrated by China’s ethnic minorities and nothing compares to the sheer joy of dousing your friends with buckets of water. If you want to extend your stay, there are plenty of guesthouses in each village that are sure to welcome you. In the Dai language, the word “man” means “village”, while the word “jiang” means “strips of bamboo”. The Dai people commonly strap bamboo strips to heavy items in order to help carry them. According to local legend, long ago one of Buddha’s ancestors came to this village and commented on a stone, which he said had a particularly auspicious aura. He asked the locals if they could carry the stone to a small hill by the river, thus making the hill a holy place for people to visit. The stone was far too heavy to move simply by pushing it, but with the help of bamboo strips the locals were able to carry it up the hill. Buddha’s ancestor was elated and renamed the village Manjiang in honour of this good deed. The name “manchunman” translates literally to mean “the village of gardens”. That being said, bizarrely Manchunman is not famous for its gardens but rather for the magnificent Buddhist temple at its centre. 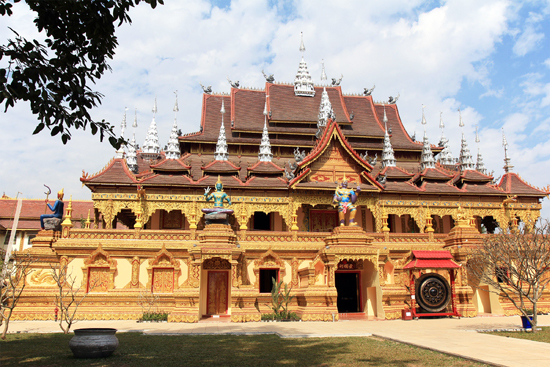 The Manchunman Buddhist Temple is over 1,400 years old, making it the oldest temple in Xishuangbanna, and stunning painted murals of Buddhist legends further enhance the value of this sacred place. You’ll be pleased to know that the word “manzha” translates to mean “cook’s village” so, if you’re looking for some tasty Dai dishes, this is the place to go! In ancient times, the tribal leader of the region would set aside a special village that was only to be inhabited by cooks. These chefs would train for years to prepare suitably delicious meals for the tribal leader. If you think having your own chef is indulgent, imagine having a whole village of them! Nowadays the villagers welcome visitors to try their local cuisine, which has been honed to perfection over hundreds of years. The 200-year-old Manzha Temple in the village is also worth noting, as it is one of the only Buddhist temples in existence that contains images and statues of monks but none of Buddha himself. Although the name “manting” means “court garden”, the village was once commonly known by its nickname, Peacock Village, thanks to the many tame peacocks that once populated Manting. Nowadays the village has become particularly famous for its White Pagodas and Buddhist Temple, which date all the way back to 669 AD. The statue of Buddha in the temple is said to be the largest in the Ganlan Basin. In the Dai language, the name “manga” inexplicably means “going to the fair”; a name that seems completely unconnected to the village’s history. 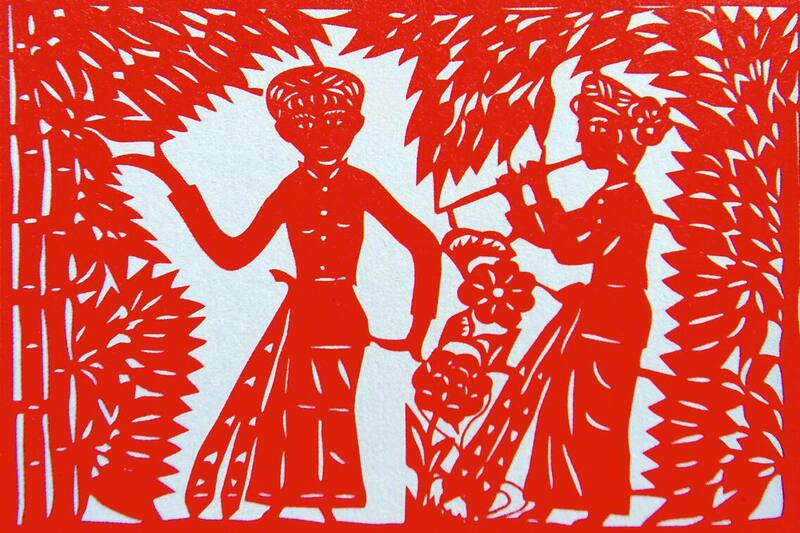 It is believed that Li Daorong, a man of the Han ethnic group, married a Dai woman and established the village. Thereafter, many Han people came from Guangdong and Guangxi to settle in Manga. Gradually members of the Han and Dai ethnic group mingled and so now many of the villagers are a mixture of these two ethnic groups. The Manga Temple, hidden in the forest behind the village, looks almost like a pavilion. Regardless of what time of day it is, the interior of the temple is always drenched in darkness and must be lit by candles or lighted lamps. Two door-gods flank the entrance and, deep within the temple, there lies an offering stand where locals can worship Li Daorong. On March 6th or July 7th every year, the Dai and Han people from Manga will bring a pig’s head, a cockerel, joss sticks, and paper money as sacrifices to Li Daorong. 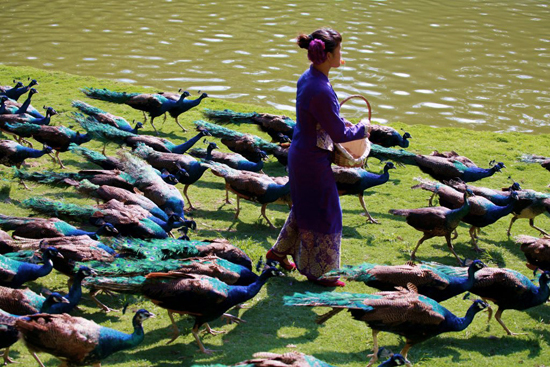 According to local legend, in the 1960s a golden peacock inhabited the Ganlan Basin and, when it died, it brought great wealth to the local people. As a symbol of their appreciation, the people buried the peacock together with the treasured sword that once stood at the centre of the five villages. On the 14th day of July according to the Dai calendar, male villagers carry a pig’s head and wrapped rice to the tomb as offerings to the peacock. A large banquet will then be held and a memorial service for the peacock will take place. While wood, brick, concrete and even tile have been used to build houses for decades, the Dai ethnic minority are one of the few communities in China that have taken advantage of another novel and abundant resource. From the bases to the rafters, traditional Dai households are made almost entirely of bamboo! These two storey houses are normally square or rectangular in shape and their unique style dates back over 1,400 years. Large, load-bearing bamboo shafts are used to make the main framework of the house, whilst narrower ones are used to make the walls. In fact, the Dai have become so industrious with this versatile material that they even use bamboo twigs to bind together the bundles of dry grass used to thatch their roofs! The upper floors of these houses are perched on thick stilts while the area under the stilts, or the ground floor, is either open or partially walled. This ground floor area is used to shelter livestock and store food, while the upper levels are used as a living space. Each household will have separate rooms for eating, working, and receiving guests, along with several bedrooms and a balcony used for drying laundry and storing the water tank. They are designed to be well-ventilated, as the Dai live in a very humid climate, and the living area is far off the ground to avoid flooding, poisonous snakes and insects such as mosquitoes. With a design this comprehensive, the only thing the Dai people have to worry about are hungry pandas! According to local legend, the idea behind these houses came long ago, when a man named Zhu Geilang was travelling through Xishuangbanna. There he met a Dai youth named Yanken, who asked for his advice on how to build a better house. Zhu thought for a moment, then crouched down and pushed a few chopsticks into the earth. He took the hat from his head and placed it over the chopsticks, then turned to Yanken and said, “Just build it like this”. I dread to imagine what our houses would look like if we based them on our fashion choices! The Dai people have an enduring reverence for water, so it should come as no surprise that every village has a water-well that is loved and respected by the community. However, these are no ordinary wells! They look like tiny towers, resplendent with metre-high archways, painted decorations, golden roofs, and even elaborate sculptures of animals. A fence surrounds the well itself, outside of which people must use a long-handled bamboo ladle to scoop water into their buckets. It is forbidden for children to play near the well, for women to wash clothes in the well, and for men to water their cattle at the well. Basically, play it safe and don’t do anything near the well! The Dai are devout Buddhists and so each of their villages will have its own temple. These temples tend to conform to the traditional Buddhist style of architecture but have an ethnic flair and follow the Chinese tradition of being placed in isolated and auspicious locations on mountainsides or deep within forests. The average temple complex consists of a temple gate, a main hall, rooms for the resident monks to live in, and a special room for housing the drum. Large temple complexes will have a number of pagodas that are used as repositories for Buddhist relics. 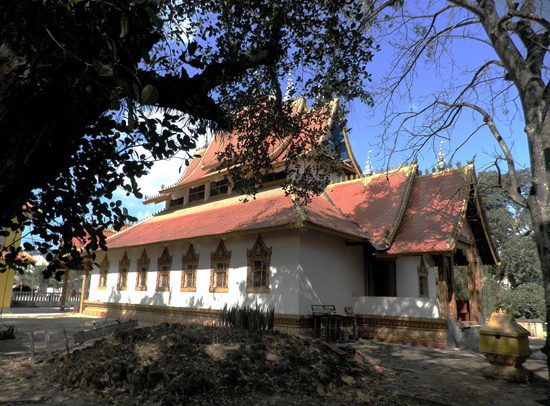 The interior and exterior of the temple buildings are often painted with panoramic murals depicting scenes from both Dai folklore and Buddhist history. They typically feature images of Buddha, various princes and princesses, and animals such as white elephants, horses, and deer, all stunning in their multi-coloured glory. The main hall is situated on the east-west axis and is the primary place of worship. Monks gather here to light incense, chant sutras, and conduct a number of other religious activities in reverence to Buddha. The hall is punctuated by a dividing wall, which is at the central point where the roof slopes down on either side. The side of the hall facing eastward is home to a large statue of Buddha, which is arguably the most vital feature of any Buddhist temple. The Dai people traditionally depict Buddha in a sitting position with “snail-shaped”, “flame-shaped” or “lotus-flower-shaped” hair and an exposed right shoulder. In order to draw attention to both his intelligence and his fabulous hairdo, his head makes up one-third of the height of the statue, although smaller figures are usually more naturally proportioned. While the Han Chinese traditionally depict Buddha as plump and smiling, the Dai’s representation is usually much slimmer and has an elongated face transfixed in a subdued expression. Long ago there was a young princess, who spent lazy afternoons wondering what type of man she would eventually marry. One day, the princess turned to her male servant and asked him, “Who do you think I will marry?”. Without missing a beat and with great confidence, the boy replied: “You are going to marry me”. The princess was deeply offended by the servant’s gross impertinence and, in a fit of rage, grasped a knife from a nearby table and threw it at him. The knife grazed the boy’s forehead, leaving a deep gash that would never fully heal. The princess had him banished from the country and assumed she would never to see him again. As the boy grew, he worked tirelessly to become successful and eventually became king of a neighbouring nation. Rulers would often use intermarriage to show solidarity between their countries, as was the custom back then, and so a marriage was arranged between the young king and the princess that he had once served. On their wedding day, the princess looked up at her husband-to-be and noticed the deep scar on his forehead. She immediately recognised him as the servant boy she had banished all those years ago and was overwhelmed with remorse. Placing her right hand between his, she twined their hands together as a symbol of her eternal devotion to him. This simple yet poignant gesture, known as “shu huan” or “the twining of souls”, has become an integral part of Dai marriage ever since. Sometime between the Door Opening Festival and the Door Closing Festival, this thread twining ceremony will take place as part of an engagement ritual before the official wedding. It begins with the host first praying for the couple and then taking a long white thread, which he winds around the couple’s hands. Thereafter other family members will approach the couple and perform the same gesture, followed by other guests such as friends. This act symbolises that the two have intertwined their destinies and will have a long, healthy and happy life together. On the wedding day, members of the extended family and friends will gather in the bride’s home, where a long bamboo table has been set up. On this table, the bride’s family will have laid out two cooked chickens, a cup of wine with a betel leaf next to it, a bowl of sticky rice, salt, and a white thread. The host is offered the most honoured position at the table, while other relatives and friends arrange themselves around it accordingly. The wedding begins with the bride and groom kneeling before the host as he gives a congratulatory speech. Other guests listen with their right hands firmly on the table to show politeness. Once the speech is finished, the bride and groom must run for the betel leaf near the cup, as the first person to get to it will supposedly have the final say in future family life! If the same were the case with our tradition of catching the bouquet, I’m sure we’d see a lot more men with flowers in hand! The couple then each pick up a dollop of sticky rice and dip it in the cup of wine as a sacrifice. In much the same manner as before, the thread twining ceremony takes place again. After this second thread twining, the first cooked chicken is given to the host and the other is divided amongst the unmarried men in the hopes that they’ll find love that year. I suppose it’s the Dai way of saying don’t chicken out when it comes to girls! The eldest guest is then asked to knead the sticky rice into a triangle, sprinkle salt on it, and place it on a tripod above a charcoal fire. The rice is allowed to burn and fall off the tripod unhindered, which foretells the stable and unobstructed progress of the couple’s love. Later on, when the bride becomes pregnant, strangers are forbidden to enter her house at any time. If you happen to notice a special object made of bamboo hanging near the main door of a Dai household, this means that a member of the family is pregnant and nearing childbirth. All visitors will be refused at this time, including family members. For over 1,000 years, the people of the Dai ethnic minority have been devout Buddhists and subscribe to a sect of the religion known as Hinayana. They adopted the Indian religion sometime between the 6th and 8th centuries and it has had a profound influence on their culture, virtually shaping many of their customs and practices. From the temples that rest like jewels at the heart of every Dai village to the many murals depicting the history of Buddha, the love and admiration that the Dai have for their faith is palpable everywhere. According to the Dai’s Buddhist beliefs, the world of the senses is void and in order to reach paradise, or nirvana, one must first achieve a state of enlightenment by releasing ones grip on the material world and transcending the demands of the senses. To become enlightened, one must follow the Tripitaka, which is an umbrella term for three categories known as sutras, abhidharma and vinaya. Sutras are the sermons of Gautama Buddha, the founding father of Buddhism, that have been transcribed. Adhidharma is the philosophical and psychological discussion and interpretation of Buddhist doctrine. Vinaya are the rules and regulations that apply to Buddhist monks, such as dress code, dietary restrictions, and appropriate behaviour. The religion plays such a focal role in the lives of the Dai people that it is common for most boys between the ages of 8 and 10 to be sent to a temple. There they will learn how to read, write, chant scripture, and learn sutras. After between one to five years, many of them will return home in pursuit of a secular lifestyle while some will stay on at the temple as monks. This practice evolved because, in the past, this was the only way that boys could receive an education and in exchange the parents would financially support the temple. So remember, even in ancient times you couldn’t get out of going to school! Yet while the Dai officially follow Buddhism, many communities still hold on to their ancient shamanistic and animistic beliefs. 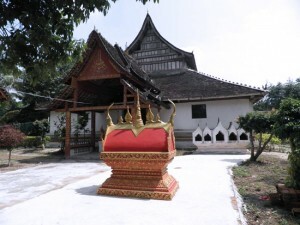 In Xishuangbanna Prefecture, there is a Dai proverb that states: “Buddhism is for our future, but the cult of the village gods is what helps us in the present”. Their indigenous religion still plays a vital role in daily life and many villages will have sacred groves or forests where they believe the spirits of their ancestors live. These spirits act as protective gods that watch over the village and people will only enter the forest on two occasions during the year, both times as part of a ceremony to honour the ancestors. All of the animals and plants, the water and even the soil in this forest is sacred and cannot be damaged or taken away. It is forbidden to cut the trees, hunt the animals, cultivate the earth, or gather the fruits from this forest. Anything that dies, even fruit that falls from the trees, is left to rot naturally. So if a tasty mango on the forest floor catches your eye, be sure to check with the locals before you eat it! Shamanism: The practice of attempting to reach altered states of consciousness in order to communicate with the spirit world and channel its energy. This can only be done by specialist practitioners known as shaman. The Dai calendar begins with a New Year celebration known as the Water Splashing Festival, which takes place sometime in April and is their first Buddhist festival of the year. It is sometimes called “Shanghan” or “Jingbimai” in the Dai language, meaning “New Year”, but is more often referred to as “Hounan” or “Water Splashing Festival”. 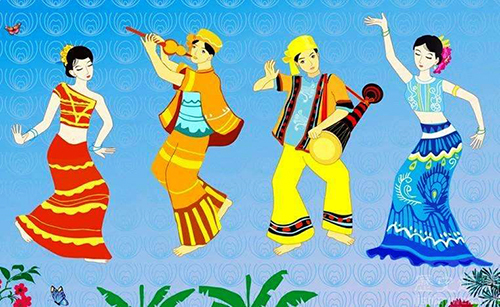 The jovial nature and lively atmosphere of this festival has earned it great fame throughout China. That and it provides anyone with the opportunity to douse their friends in water! The first day, known as “Wanduoshanghan” or “New Year’s Eve”, is marked by dragon-boat races and the firing of gaosheng (a type of homemade firework). These acts symbolise saying goodbye to the old year. The following two days are called “Wannao” and involve similar activities. The final day of the festival, known as “Wanbawanma” or “when the King of Days comes”, is the most famous and involves the characteristic water splashing. Early in the morning, all of the villagers will take a ceremonial bath, change into new clothes, and carry offerings to the local temple. On arrival, they will build a tower of sand and arrange themselves around it. There they will listen to the preaching of Buddhist scripture and then help clean the temple. Finally a statue of Buddha is carried out of the temple and is bathed by the local women. This is followed by a more playful display, where villagers splash one another with water. This water fight, so to speak, can involve anyone who happens to be passing by and is a favourite pastime among younger members of the community. It is punctuated by the sprightly sound of elephant-foot drums and bronze gongs. The Dai believe that anyone who is splashed with water during the festival will have good luck in the following year, so splashing someone is a sign that you are wishing them well. There is even a popular Dai saying which goes: “At the Water Splashing Festival, soak whoever you think is worthy”. The origin of the Water Splashing Festival is rooted in an ancient legend involving a demon that once plagued the Dai people. Long ago, the Evil King of Fire descended on the Dai homeland and perpetrated all kinds of misdeeds. The local people hated him bitterly but his powerful magic meant no one was capable of opposing him. He had already taken seven beautiful wives from the community, who all despised him, but one day the seventh wife hit upon an ingenious plan. She grew close to the demon and persuaded him to expose his weaknesses. It turned out the demon was impervious to human weapons but his hair, which was sharp as razor wire, could harm him. Once he was sound asleep, all of the wives gathered by his bedside and wrapped his hair around his neck. With one mighty pull, the hair sliced through the demon’s throat and cut off his head. However, once the head touched the ground it caught fire and would have burned down their bamboo house were it not for an act of selflessness by one of the women. Swiftly she rushed to scoop up the head and held it tightly in her arms. To her amazement, the fire died out immediately. Yet as soon as she dropped the head it would start burning again. So the seven women agreed that each year they would take turns holding onto the head, exchanging it only on the fateful day when they killed the demon. When the time came to pass the head on, the local people would splash water on the girl who had previously held the head to wash away the demon’s blood. Over time, this ritual came to signify the beginning of a new year and developed into the happy festival we know today. If you’ve read any of the legends behind many Dai customs, you’ll know that the Dai people have something of a complicated relationship with dragons! On the one hand, dragons can bless man with a good harvest, but they can also be vicious and dole out punishment indiscriminately. The Dai regard dragons as deities and the Dragon Homage Festival, which normally falls sometime in January, is the closest celebration in the Dai calendar to the traditional Chinese Spring Festival. During this festival, a monk from the village temple will arrange a collection of food and clothing to be sacrificed to the Dragon God. Every villager must contribute, regardless of their wealth or social standing, but gifts will be commensurate with one’s wealth. For example, a rich family might offer gold or silver while a poor family may simply offer rice or flowers. All offerings are placed inside the temple, where they are preserved in a makeshift “Dragon Palace”. When the time comes, the monks carry the “Dragon Palace” down to the Menglong River and place it on a bamboo raft. The raft is then left to float away while the locals pray and the monks chant Buddhist scripture. Other Dai festivals include the Door Closing and Door Opening Festivals, which take place in mid-September and mid-June respectively. They predominantly involve the sacrifice of food, flowers, clothes, and other wealth to Buddha. The Dai are renowned throughout China for the grace, poise and elegance that they employ in their performances. From the ethereal Peacock Dance through to the lively Elephant-Foot Drum Dance, both men and women take part in this vibrant tradition. Performances will be accompanied by a variety of instruments, including the lusheng, bronze gong, clarinet, and hulusi, but none are as important as the elephant-foot drum. This indigenous instrument has played a focal role in Dai festivals for decades and its history is intrinsically linked with that of the Dai people. According to legend, in ancient times the homeland of the Dai people was frequently subjected to severe flooding. These floods destroyed many homes and killed many people, and it was not long before the locals learned that a nearby dragon was responsible for these disasters. A brave Dai youth, accompanied by his fellow villagers, went out into the forest and slay the dragon. The dragon’s body was stripped of its hide and its skin was stretched over a hollowed out log to form a special drum, which was gifted to the youth in honour of his courage. Though no elephants were strictly involved, the unusual shape of this large drum earned it the name “elephant-foot drum”. Nowadays the drum is made using hollowed out tree trunks or logs that have been covered in sheep skin or cowhide, since dragon skin is somewhat hard to come by. It is then painted and ornamented in peacock feathers. It can be long, medium-length, or short depending on the sound desired, as each drum can only produce one note. Originally they were covered in python skin but the potential endangerment of that animal warranted the change. A strap is attached to the drum that allows the performer to sling the instrument over their shoulder and beat it with their right hand as they dance, using their left hand to steady or shift it. Like a herd of Asian elephants trampling through the rainforest, the elephant-foot drum makes up for its lack of sound variety by being incredibly loud! In keeping with the animal theme, the most famous performing art among the Dai is that of the Peacock Dance. The Dai revere the peacock as a symbol of happiness, beauty and kindness, and it appears that, according to local legend, this colourful bird was also once a devout Buddhist! In ancient times, the peacock was neither beautiful nor particularly colourful, and its tail fathers did not possess the characteristic “eyes” that they are known for today. It was a tame and obedient animal that lived a simple life. One year, word spread that Buddha himself would descend to earth and grace the local temple with his presence during the Baipala Festival. Meanwhile, in a remote mountainous region far away, a peacock learned of the news. This peacock happened to be a Buddhist and so flew for miles and miles to reach the temple. Fortuitously, its arrival happened to coincide with that of Buddha’s! Unfortunately throngs of worshippers had already rushed to the temple and it was so overcrowded that the peacock could not get a decent view. In its agitation, it began pacing back and forth behind the crowd. At that moment, Buddha noticed the anxious peacock and cast a beam of light in its direction, lighting it up in iridescent splendour and creating the many “eyes” along its tail feathers. As Buddha prepared to depart, he turned to the peacock and told it that they would meet again. Thereafter every time Buddha descended to earth during the Baipala Festival, he would first meet with his human worshippers at the temple and then go to the remote mountain where the peacock lived. There he would watch the peacock prance, dance, and show off its beautiful tail. It was the peacock’s dedication to Buddha that earned it such beauty and so, during major festivals, the Dai perform the Peacock Dance in its honour. The dance is characterised by its use of undulating arm and torso movements. Several of the steps aim to imitate peacock behaviour, such as strolling, looking for water, peering intensely, bathing, drying the wings, spreading the tail feathers, and flying the nest, and these set movements are punctuated by free-form dance moves chosen by the performer. The clothes are normally patterned after the peacock’s tail feathers and endow the dancer with an otherworldly beauty. Lusheng: A wind instrument made of multiple bamboo pipes, each fitted with a free reed, that are all in turn fitted into a large, hardwood pipe. Normally there are five or six bamboo pipes that are each of a different pitch. Air is blown into the hardwood pipe to create sound. They vary in size from small, handheld ones to ones that are several metres in length. Hulusi: Also known as the cucurbit flute or “bilangdao” in the Dai language. It is a Chinese free reed wind instrument made up of three bamboo pipes attached to a gourd-shaped wind chest. The central pipe has finger holes, while the two outer pipes act as drone pipes, and air is blown into a mouthpiece at the front of the wind chest. In their multi-coloured silk skirts and tight-fitting shirts, the Dai women look as fragile and beautiful as flower petals. Their clothes, particularly their underclothes, are normally block, pastel-colours such as sky blue, spring green, blossom pink, or snow white. Traditionally their short shirts expose a portion of their lower back and have a bejewelled collar. They button down the front or the right side, and can be sleeveless, short-sleeved, or long-sleeved. The accompanying skirt or sarong is tight-fitting, narrow and long, ranging from calf to floor-length. In some areas, women will wrap multi-coloured silk girdles around their waist to further emphasise their slender midriff. Resplendent in their simple elegance, with their long hair curled in a bun and fastened by a decorative comb, the Dai appear like lithe pixies gliding through the tropical rainforests. With such a wealth of natural beauty, the women rarely bother with embellishments but some young women will decorate their hair with fresh flowers while older women will wear a bamboo straw hat for practical reasons. Although jewellery is not as popular among the Dai as it is with other ethnic minorities, they will sometimes wear silver earrings, necklaces, and bracelets, and are fond of articles made from jade, agate or coloured glass. Historically, a bizarre tradition amongst the Dai women resulted in them being referred to as the “old teeth” or “blackened teeth” people during the Tang (618-907) and Song (960-1279) Dynasties. This tradition involved chewing betel nuts until ones teeth became completely black. Blackened teeth were considered a modicum of beauty and modesty by the Dai, and from a practical standpoint it appears that the betel nut juice also prevented cavities! A similar practice was carried out by Japanese women during the 16th century for roughly the same reasons so you never know, with fashion becoming ever stranger and dentistry becoming more expensive, we may see a revival of the “old teeth” look in the coming years! The traditional dress of Dai men resembles that of the women, although it is not as ornate and they don’t wear skirts! They prefer tight-sleeved collarless jackets that are buttoned from the front or the right side, which are accompanied by loose trousers. They are often seen wearing white, black, or blue turbans and, during the winter months, it is not uncommon to see a man with colourful blankets draped over his shoulders. However, like the black-toothed women, the Dai men have an obscure aesthetic tradition that dates back hundreds of years. When a boy reaches the age of about 11 or 12, he will normally invite a tattoo artist to adorn his torso or limbs with designs of animals, flowers, geometric patterns, or letters of the Dai script. First the pattern will be drawn on the skin using a coloured dye, and is then pricked into the skin using a fine needle. This allows the dye to sink into the skin and, after a period of time known as the “curing period”, the tattoo is permanent. According to local legend, the Dai people were once nomads who were desperately searching for a suitable homeland. They would move from river to river in search of fish to eat but, one day, they came upon a river guarded by a fierce dragon. The dragon’s eyesight was poor so it would only attack based on colour. In an attempt to deceive the water dragon, the Dai painted their skin in the colours of the dragon himself. However, as they entered the river to fish, the paint gradually washed off and the dragon, realising they were not kin, fell upon them with renewed rage. Luckily, the Dai managed to escape but were crestfallen that their plan had failed. It was then that a clever shaman figured out how they could make the paint permanent. By applying the paint and then pricking the skin, the colour would sink into the skin itself and the pattern would stay. This is how the Dai practice of tattooing was born and, when it comes to tattoos, the Dai men believe “the more, the better”. I suppose you’d feel the same way if your tattoos were the only thing standing between you and an angry dragon! The Dai are one of the happiest and most carefree of all the ethnic minorities in China and this is reflected in their chosen name, which means “freedom” in the Dai language. Just over one million Dai people currently live in China, predominantly concentrated in Yunnan province, but the term Dai can also be applied to communities in Thailand, Laos, Burma, Myanmar and Vietnam. This is because the illustrious ancestors of the Dai people, known as the Bai Yue, Bai Yi, or Bai Ye people, are thought to be shared with the Lao people of Laos, the Shan people of Myanmar and the Thai people of Thailand. Talk about a big family! And if that wasn’t enough, the Zhuang, Dong, Shui, Bouyei, and Li ethnic minorities also identify the Bai Yue as their ancient ancestors. Although we doubt there’s a space large enough for a family reunion, these ethnic groups all share undoubtedly similar features that point towards their common heritage. According to historical records, the first references to the Dai’s ancestors were made during the Qin (221-206 B.C.) and Han (206 B.C. – 220 A.D.) dynasties. The first Dai prefecture, known as Yizhou Prefecture, was set up in 109 BC by Emperor Wu of the Western Han Dynasty. It took up a large portion of southwestern Yi, which in turn covered parts of modern-day Yunnan, Guizhou and Sichuan. It appears the Dai people lucked out, as the patch of land they were designated was incredibly fertile and benefited from an excellent climate! This encouraged the Dai to become accomplished farmers and they are believed to be the first to have used elephants and oxen to plough the land. They also developed complex irrigation systems to help farm rice more effectively, so next time you’re in China and you’re enjoying a hearty bowl of rice, remember to thank the Dai. And the elephants! Nowadays the vast majority of the Dai population can be found in Xishuangbanna Dai Autonomous Prefecture and Dehong Dai and Jingpo Autonomous Prefecture, both in Yunnan province. They can be further subdivided into the Dai Neua, which are mainly found in Dehong, and the Dai Lue, which are mainly found in Xishuangbanna. 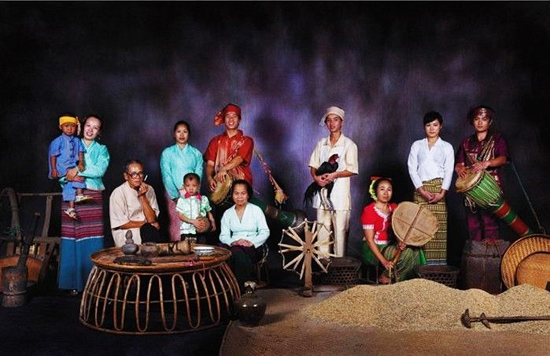 Like many ethnic minorities, their language is incredibly complex and different Dai communities will speak one of some five southwestern Tai languages, known as Tai Lü, Tai Nüa, Tai Dam, Tai Ya, and Tai Hongjin. All of these spoken languages are closely related to those of the Zhuang and Dong ethnic minorities. In keeping with this level of complexity, they also have an alphabetic writing system that is separate from the character-based Chinese script and can be split into four branches. If you thought learning French at school was hard, imagine trying to learn five different spoken languages and four different ways of writing! Their writing system originates from the Indian alphabet and is classified as a variant of Sanskrit. They use this script to keep a record of their history and preserve their folklore. 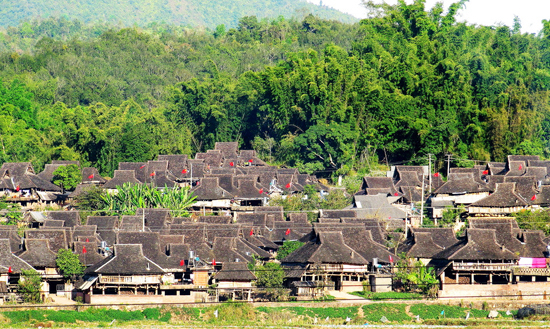 The average Dai village is usually made up of about 40 households, with larger villages consisting of nearly 100. They are normally situated close to rivers or streams, as the Dai people revere water, and feature a large banyan tree or sacred forest, where the locals believe the spirits of their ancestors live. Even the smallest of villages will have its own Buddhist temple or pagoda, as the Dai are devout Buddhists. The peacock is also greatly admired as a symbol of beauty, honesty, and peacefulness. Their Peacock Dance has garnered great fame in China for its grace and use of complex arm movements. Just imagine Swan Lake but with a lot more colour! 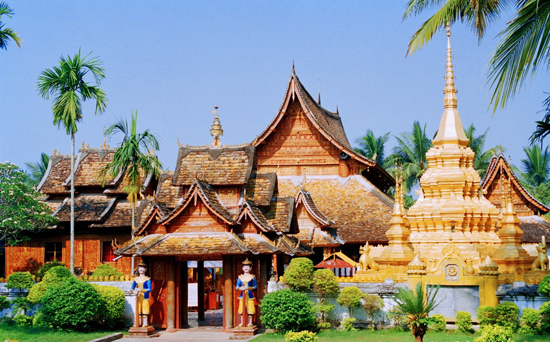 If you want to experience Dai culture first-hand or simply take part in their delightful Water Splashing Festival, we recommend visiting either Manting Park or the Dai Ethnic Garden in Xishuangbanna. There you can enjoy some of their delectable bamboo fried rice, take part in the water splashing festivities, or simply admire the elegant dress of the Dai women.